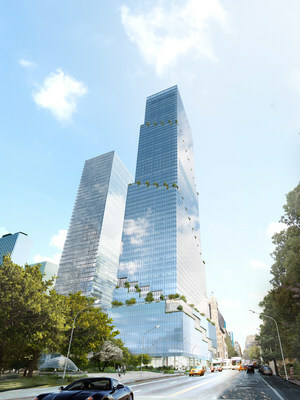 NEW YORK, April 11, 2019 /PRNewswire/ -- Tishman Speyer, one of the world's leading developers, owners, operators and asset managers of first-class real estate, and AllianceBernstein (AB), a leading investment management firm, announced today that AB will lease 189,000 square feet at The Spiral, the 65-story office tower under development at 66 Hudson Boulevard in Manhattan. Beginning in January 2025, the prominent financial services firm will occupy floors 25 through 28 under a 20-year lease agreement. The transaction demonstrates continued leasing progress for Tishman Speyer at its 1,031 foot office tower, which is currently rising on Midtown's West Side. In 2018, Pfizer, one of the world's premier biopharmaceutical companies, agreed to relocate its global headquarters to 800,000 square feet within The Spiral upon its completion in 2022. Designed by BIG-Bjarke Ingels Group, The Spiral will feature a cascading series of landscaped terraces and hanging gardens as its signature element. 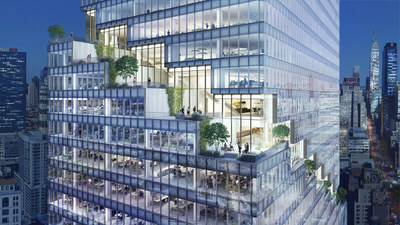 The terraces will ascend, one per floor, in a spiraling motion to create a unique, continuous green pathway that wraps around the façade of the tower and supplies occupants with readily accessible outdoor space. Tishman Speyer President and CEO Rob Speyer said, "Tishman Speyer is thrilled to welcome AllianceBernstein, which was attracted to The Spiral in part due to Bjarke Ingels' unique and inspired design. With its iconic architecture, technological innovations, top-tier amenities, amazing views and abundant access to outdoor spaces, The Spiral is raising the bar for the 21st Century creative work environment." "We embarked on an extensive search to find the right space for AB. We believe that The Spiral will help us to achieve a workplace that is equipped with collaborative tools, flexible open spaces, and state of the art staff amenities and innovative technology, all of which will help us to best serve our clients. We are looking forward to making The Spiral our New York City home," said Seth Bernstein, President and CEO of AB. Located at the intersection of the High Line and the four-acre, recently renamed Bella Abzug Park, The Spiral will encompass a full block stretching from West 34th to West 35th Streets and from 10th Avenue to the park. The six-story base of the building will include a lobby with ceiling heights of up to 28 feet and main entrances on Hudson Boulevard East and 10th Avenue. The base also will include approximately 25,000 square feet of first-class retail. The Spiral is easily accessible from all five boroughs, Westchester County and New Jersey. It is in close proximity to New York's most convenient transit hubs, including Penn Station, the Port Authority Bus Terminal, Midtown Ferry Terminal, Lincoln Tunnel and West Side Highway. The 7 Train is just steps away and three stops from Grand Central Terminal. A major New York City real estate developer, owner and operator for several decades, Tishman Speyer has more than 4.5 million square feet of modern office space under active construction in three boroughs, including The Jacx in Long Island City and The Wheeler, which is rising above Macy's historic Downtown Brooklyn department store and The Spiral. Additional building details and renderings can be found at www.thespiralny.com. Tishman Speyer is a leading owner, developer, operator and fund manager of first-class real estate around the world. Founded in 1978, Tishman Speyer is active across the United States, Europe, Latin America and Asia, building and managing premier office, residential and retail space in 28 key global markets for industry-leading tenants. The firm has acquired, developed and operated a portfolio of over 167 million square feet with a total value of approximately US $88 billion spread over 406 assets. Signature assets include New York City's Rockefeller Center, São Paulo's Torre Norte, The Springs in Shanghai, Lumière in Paris and OpernTurm in Frankfurt. Tishman Speyer currently has projects at different stages of development in Boston, Brasília, Frankfurt, Gurgaon, Hyderabad, Los Angeles, New York City, Paris, Rio de Janeiro, San Francisco, São Paulo, Shanghai, Shenzhen and Washington, DC. The firm also operates portfolios of prominent office properties in Berlin, Chicago and London. For more information, visit tishmanspeyer.com and find us on social @tishmanspeyer. AllianceBernstein is a leading global investment management firm that offers high-quality research and diversified investment services to institutional investors, individuals and private wealth clients in major world markets. As of December 31, 2018, including both the general partnership and limited partnership interests in AllianceBernstein, AllianceBernstein Holding owned approximately 35.6% of AllianceBernstein and AXA Equitable Holdings, Inc. ("EQH"), directly and through various subsidiaries, owned an approximate 65.2% economic interest in AllianceBernstein. Additional information about AB may be found on our website, www.alliancebernstein.com.